Medical child abuse can be thought of as the flip side of medical neglect; instead of failing to get real medical treatment a child needs, the caregiver seeks out medical treatment that the child does not need, and which may in fact be harmful. "Medical child abuse" is a relatively new term, coined in 2009 by Drs. Thomas Roesler and Carole Jenny. Their intent was to replace the use of Munchausen Syndrome by Proxy (MSbP) to focus more on the effects on the child, rather than on a diagnosis of the caregiver. MSbP occurs when a caregiver, particularly a parent, fabricates or induces illness in a person under their care in order to garner attention for themselves. Medical child abuse (MCA), on the other hand, focuses on the effects on the child, rather than on the intention of the caregiver. MCA is one of a number of names, including "factitious disorder by proxy", "child abuse in the medical setting", and "caregiver-fabricated illness in a child", that attempt to describe the same thing: abuse of a child by a caregiver through the fabrication or induction of illness, regardless of the intent of the caregiver (though identifying the intention may assist with treatment). Although most cases of MCA involve the mother, perpetrators may be fathers, grandparents, older siblings, or anyone else in a position to fabricate or induce an illness in the child. Cases of medical child abuse often involve a variety of organ systems (gastrointestinal, cardiovascular, neurological, etc.). Symptoms may fluctuate, though they typically occur in the presence of the caregiver, or the caregiver is the only one who witnesses the episode. The perpetrator of the abuse will often "doctor shop" or seek numerous opinions and interventions for the child's condition. Occasionally, the victim of the abuse may even collude with their abuser to fabricate their own illness. Thankfully, the reported incidence is low, at around 0.5 to 2.0 cases per 100,000 children under 16 years of age, though it is also believed to be under-reported, due in part to the difficulty in identifying the abuse. The goal in identifying medical child abuse is to stop current harm to the child, as well as to prevent future harm. But diagnosing MCA can be incredibly difficult. The relationship between a parent and their child's doctors is built on trust. Doctors trust that their patients and families will give them an accurate account of the signs and symptoms experienced, as well as anything that might have contributed to the illness described. When a child is the victim of MCA, however, the caregiver might make up the symptoms, or they might take actions that cause the symptoms - for example by poisoning or suffocating the child. The caregiver's actions then lead to tests or treatments that not only are unnecessary, but may be invasive or have increased risk for the child. When those tests or treatments have no effect on the child's apparent illness, it can lead to further tests and treatments that cause further harm to the child. That may be one of the first clues that more is going on than the parent is saying. Source: Flaherty and MacMillan, 2013. 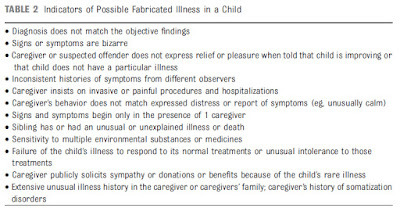 A child's alleged symptoms may be inconsistent with objective tests, they may only occur in the presence of the caregiver, or they may be unusually resistant to treatment. The clinical history may also have numerous inconsistencies. Additionally, the caregiver's own behavior may hold clues: their reactions may not match the severity or seriousness of the situation, they may not be relieved when they're told the child is improving, and they may insist on invasive procedures, even if there's no medical indication for them. These points are congruent with a pattern where caregivers may also seek out multiple different doctors or specialists to pursue additional treatments and procedures. As mentioned above, diagnosing medical child abuse can be very difficult. 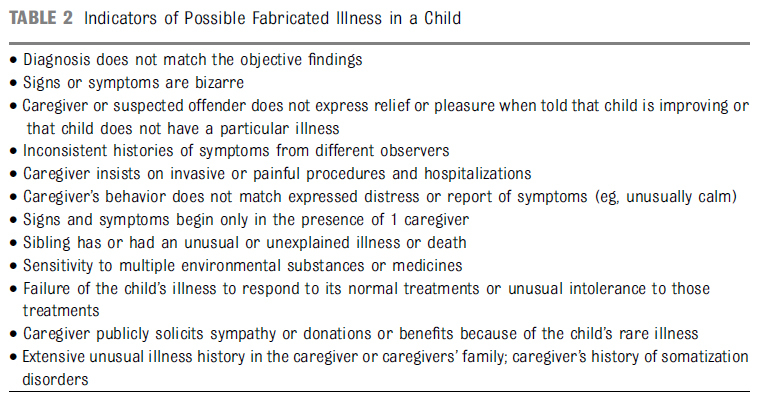 When the caregiver exaggerates or makes up the symptoms, they may not be present when the doctor examines the child. Symptoms may be nonspecific, leading the doctor to suspect a more common ailment. Even when the symptoms do not match normal physiology, the physician may suspect a rare disorder, rather than maltreatment. There may even be some real underlying medical illness that, combined with the fabricated symptoms, confound an accurate diagnosis. Compounding the problems with identifying medical child abuse, treating physicians may not communicate with previous doctors to discuss the case and obtain additional details. Even in cases where medical child abuse is suspected, where there are clues, doctors may still not report it. 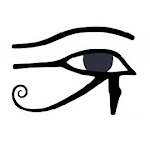 They may feel that there is insufficient evidence to support their report. Occasionally, they may have previous experiences with child protective services that deter them from reporting, such as when CPS has not taken action to protect a child. Reporting is also not without legal risk to the doctor, who could be subject to a lawsuit. Or the physician may avoid reporting because of the harm that an incorrect report could cause to the child and their family. Often, the only way to make a firm diagnosis of medical child abuse is to catch the caregiver in the act (for example, using covert video surveillance) or separating the caregiver from the child to see if symptoms improve in the absence of the suspected caregiver. Each of those options, however, carry their own problems. Not every health care setting is equipped to conduct video surveillance, let alone the ethical questions that arise from using it. And separation from the caregiver may erode the trust relationship with the health care provider. Then there are the rare diseases. How can physicians tell the difference? Tomorrow, I'll address rare diseases, regulations, and mandated reporting issues.